Micro Security Cameras - KPC-E23NUP3 - Only $129.95! 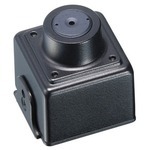 Need an amazing Super Mini Color Camera for your robot? The KPC-E23NUP3 will knock your socks off! These CCD Video Cameras employ a high performance 1/3" Sony Super HAD CCD solid-state imaging device, and offer an incredible 700TV Lines of SUPER HIGH Resolution, AGC, AWB for true color, and auto back light compensation in a metal housing. The KPC-E23NUP3 is provided with the industry standard 3.6mm precision glass lens with 92 degree field of view. These cameras come with power cables, video cables, mounting bracket, mounting screw, and installation guide. Look forward to an easy installation in most indoor applications. They're only a call and a shipment away!